Lewis Hamilton has angered his McLaren team by posting sensitive technical information on the social networking site Twitter. The 27-year-old put up a picture of a telemetry sheet showing data from his and team-mate Jenson Button's qualifying laps at the Belgian GP. The picture was removed after McLaren made it clear it was not acceptable. On Saturday, Hamilton posted a series of tweets containing acronyms for bad language, which were also removed. McLaren team principal Martin Whitmarsh said: "He was asked to take [the telemetry tweet] down and he did it immediately. He misjudged the situation. All the other ones we didn't ask him to remove, but that one he removed it and apologised. He wasn't thinking clearly obviously." Asked if that was the end of the matter, Whitmarsh said: "Yes." 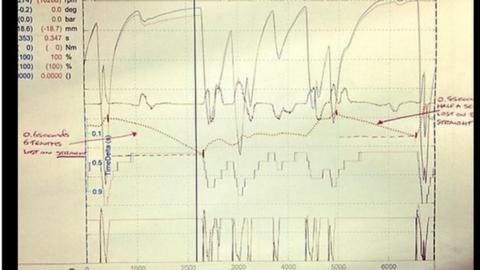 The telemetry sheet not only contained traces of the two drivers' laps, showing where Hamilton was losing time to Button, but also information about the car's settings, including sensitive data such as its ride height. Hamilton's decision to tweet the picture was met with disbelief by engineers from rival teams. McLaren - and all other F1 teams - operate on a basis of strict confidentiality. "This is effectively a war," one said on Sunday morning. Another said his decision to post the picture was "quite strange". BBC Sport understands Hamilton regrets his decision to post the picture. His tweets earlier in the weekend, which contained a series of colloquial acronyms that stand for swear words also caused a stir at the Belgian Grand Prix. Hamilton removed all of those tweets, too, but this was not at McLaren's request. The team are understood not to have been bothered by these earlier tweets - but were disappointed at the telemetry picture. Asked why he had removed the tweets with bad language, Hamilton said he wanted to "rephrase" some of the things he had said. The incident has happened at a time when Hamilton is in intense contractual negotiations with McLaren. He is out of contract at the end of the year and approaches made by his management team to other leading teams Red Bull, Ferrari and Mercedes have been rebuffed. It is understood that Hamilton will stay at McLaren and that negotiations are now dealing with details such as PR commitments and travel arrangements. Highlights 19:00 BST BBC Three.